test before promoting the page to all users and groups with the appropriate access rights. target server if a rollback is needed. Trust Association Interceptor (TAI) is used to authorize access to the servers. basic-auth-tai-sitemgmt task to be run more than once. 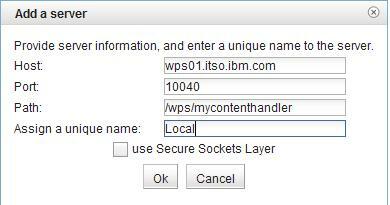 the portal and WebSphere Application Server IDs passwords. stopped and restarted for the TAI configuration settings to take effect. 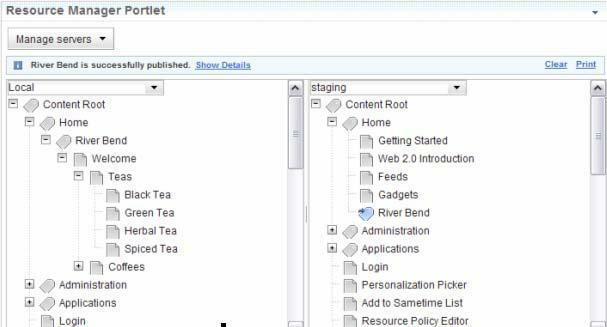 WebSphere Portal Server Infocenter for details on this topic. 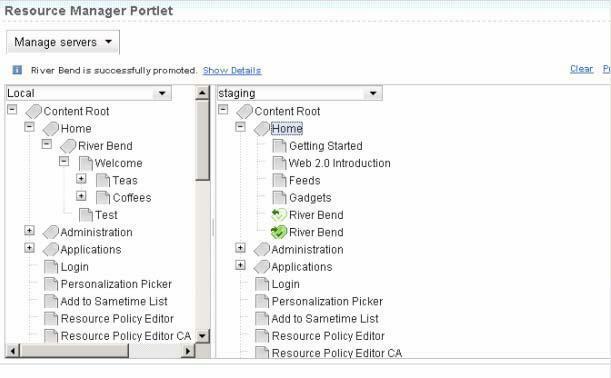 portlet, you can edit and remove servers and manage access to the servers. servers, select Administration > Site Management > Manage Servers. 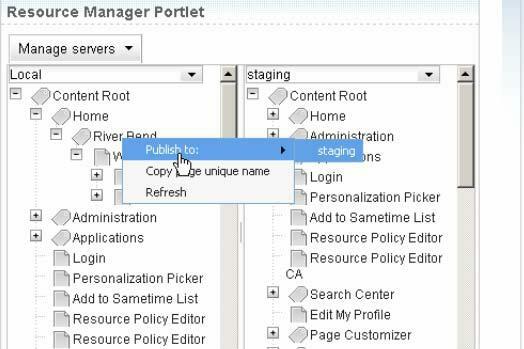 First you need to add a new server, click Manage servers > Add new server. 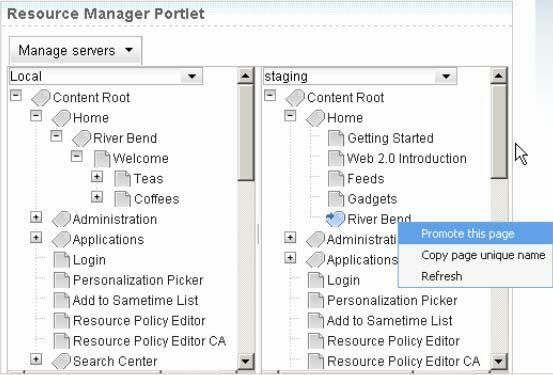 Click Manage servers and then select Manage server access. exit without saving the information. 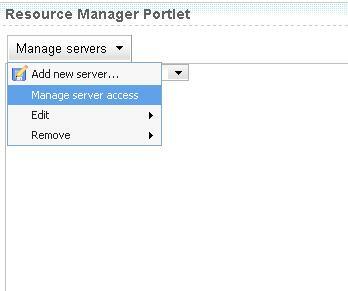 You can also edit or remove a server using the Manage Servers option. Interface. 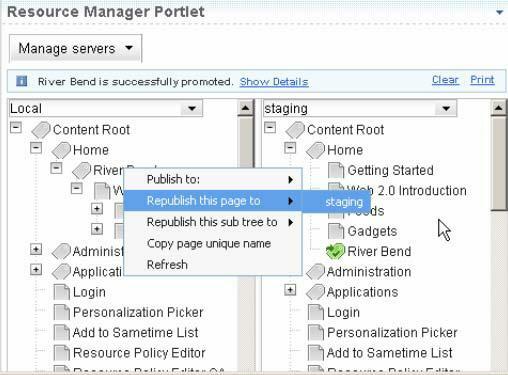 This topic describes publishing through the Resource Manager portlet. Create and test a page on your source server. without binary parameters are supported. 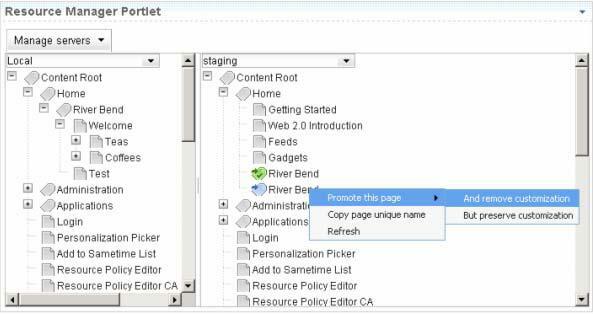  Advanced options under Edit page properties.  You can only publish pages that have a unique name. if the portlets exist on the target server. o Personalization rules. These must exist on the target server. different users. The last publish process overwrites previous publish versions.  Site management publishing does not support cross page wires. 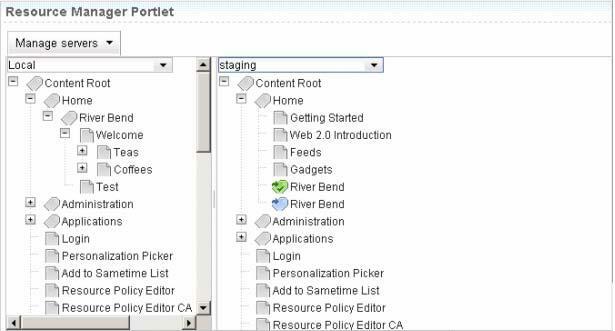 Select a source server and a target server before publishing the page. 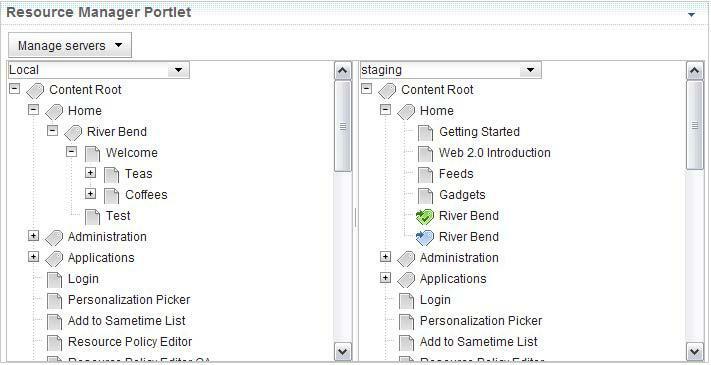 Click Administration > Site Management, select the server from the pull-down list. source server to the target server. 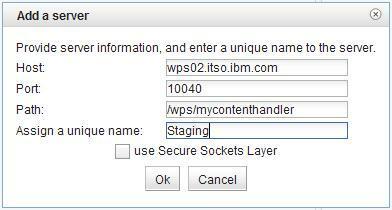 Right click on the page or label and select Publish to > servername. published page in the target server hierarchy. must have a unique name assigned to them on both the source and target servers. name; otherwise, you cannot publish the page to another server. source and target servers, and preserve the correct page-to-rule association. 3. Publishing a page into the public area of the portal is not supported. same as you with all private changes that you made to the page. functionality. In such a scenario an error message is displayed. at the same time, there is no support for merging these multiple publish actions. control which users can review the page. rule can be modified using the Personalization Rule Editor. users on the target server with the appropriate access rights can view the page. If you promote a label or a URL, the promotion takes place without further prompting. name exists already, you must choose a customization option, as described below. This option overwrites customized preferences on replaced pages. 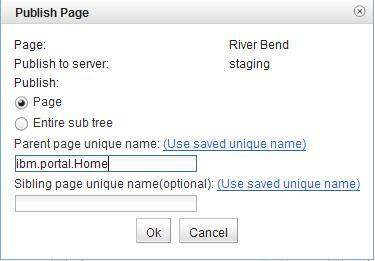 This option preserves customized preferences on replaced pages. 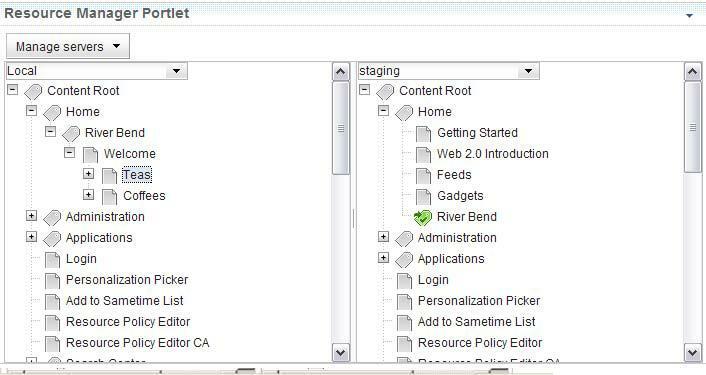 customized preferences on replaced pages. page. Also, any URL references to the old page now point to the new page. back out changes if necessary. name to republish to just that target server. server can view it, you must promote the republished page. page is no longer visible on the target server. The page returns to a published state. right click on the promoted page and select Demote this page. Thanks for your comment .I hope this website help people like you.